Greg and Edwin, the salesman, look at a Ford Transit Van. 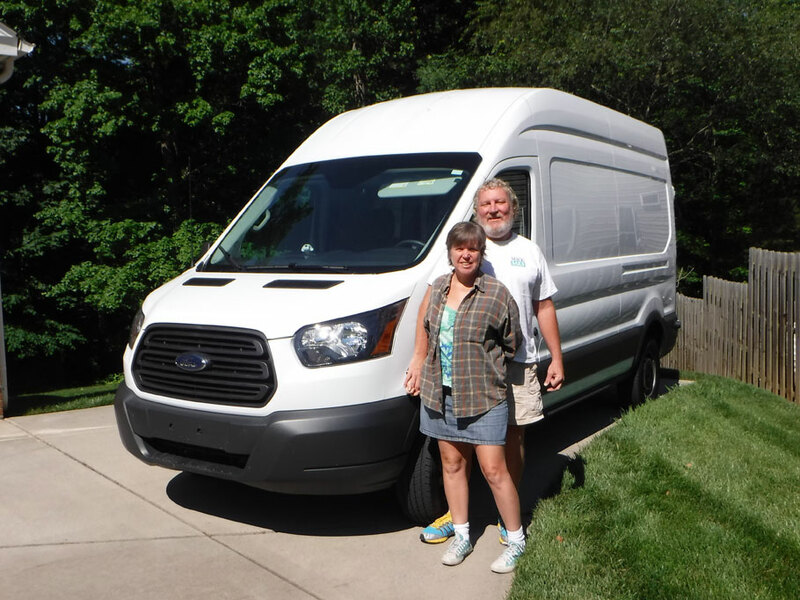 Our first choice for a new (USED) van was a diesel Sprinter. Next were gas Sprinters, Transits, and Promasters. 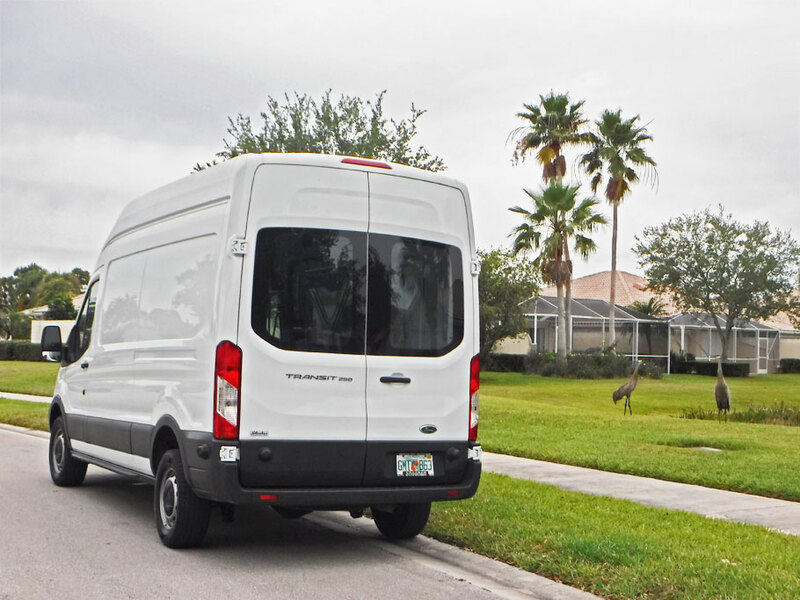 We wanted a cargo van with a ten foot long bed and six feet of standing room. It had to have windows on the back doors. If you care, HERE is a nice write-up of the different models. We wanted to buy used to save money. But not too used. We started fishing for a deal when we decided to sell A â€˜Tuin. 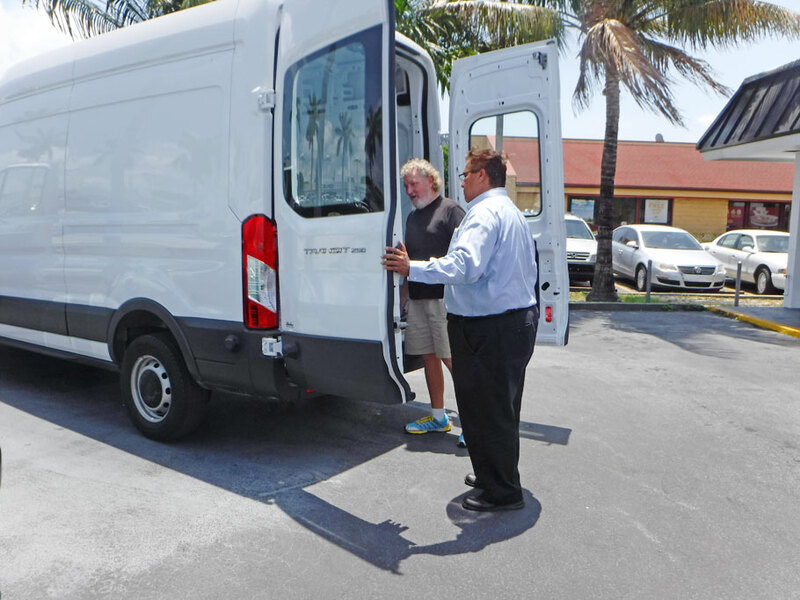 We had to cast a wide net (all of Florida) as decent used cargo vans are scarce. We did test drive some new models at first. Mostly because there were not many used ones nearby. The ones we drove had nice, high, easy rides, not what we are used to. Asking my folks for an advance on our house sale earnings, we struck out to look at some of the used vehicles weâ€™d seen online. 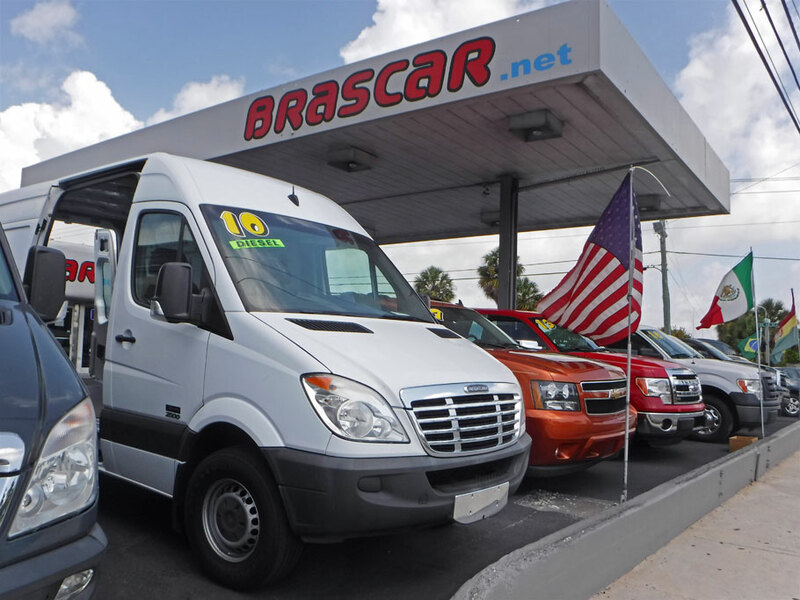 The commercial vehicle buying experience was new to us. Along with the usual small lots, we visited some large lots packed with all kinds of work vehicles inches apart (check out the google earth map at the bottom of this post to see one of the lots we visited). Not much chance of a test drive there. A few times we drove an extra hour or more to find that the vehicle had been sold. 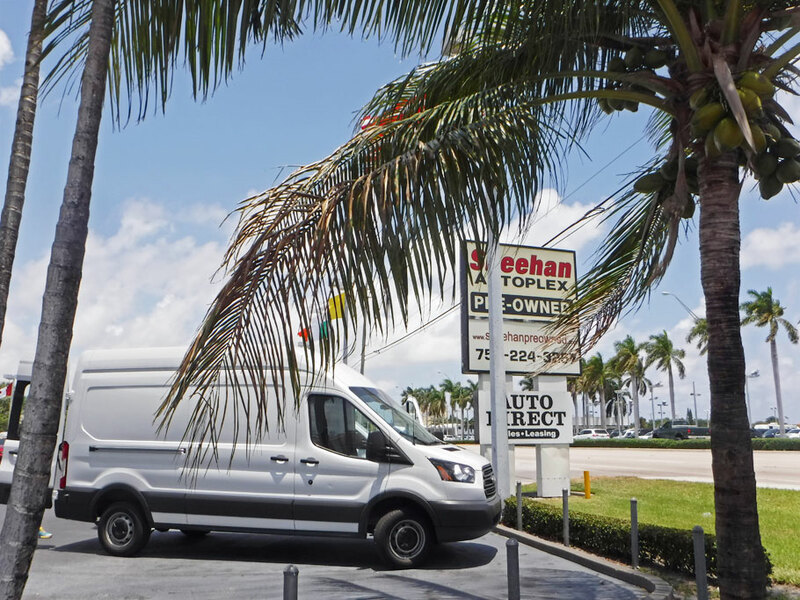 For kicks we looked at a 2015 Ford Transit in Pompano Beach. It had been an Enterprise fleet rental, and it was still under warranty. But it cost a lot more than we wanted to spend. We pushed on to Miami, where two Sprinters were waiting for us. We called ahead to make sure they were there. When we arrived, neither was available. Aaarg. We went back and put a down payment on the Transit. We love her! She has already taken us farther than Aâ€™ Tuin ever did. We have big plans for the White Whale. Sheâ€™ll be ceiled, walled and floored. Sheâ€™ll have a couch/bed and a galley. And she has lots of storage room. Introducing Ballena Blanca (white whale en espaÃ±ol). May she travel far. This Sprinter Van was a possible purchase, but it had a funny smell and made some funny noises. The most unusual van we looked at was an ambulance. We thought we might be able to recycle some of the interior, but after looking at it, we decided there was too much we would need to remove. Our new van, just waiting for us to sign the papers. Sandhill cranes come to check out the new van. Our first trip in our new van was to Greg’s parents’ house in North Carolina. That morning before we left Ballena Blanca had her first misfortune and broke her rear window. Duwan drove her from Florida to North Carolina with plastic taped over the rear window. Trust me, this little mishap was hardly a scratch compared to the issues we have dealt with Blue Wing and Great A’Tuin. Us and Ballena Blanca, the newest member of our nomadic tribe. 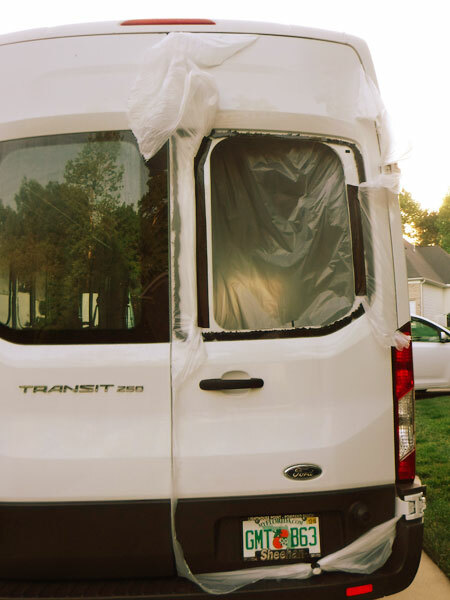 This entry was posted in Ford Transit, Van Life and tagged ford transit van, van, van life. Bookmark the permalink. Not a diesel – which is a disappointment. We are keeping track of mileage – I think it is 18 or 20 miles to the gallon. I thought the RTR hot cancelled – maybe it was a different one. Can’t wait to build our out. 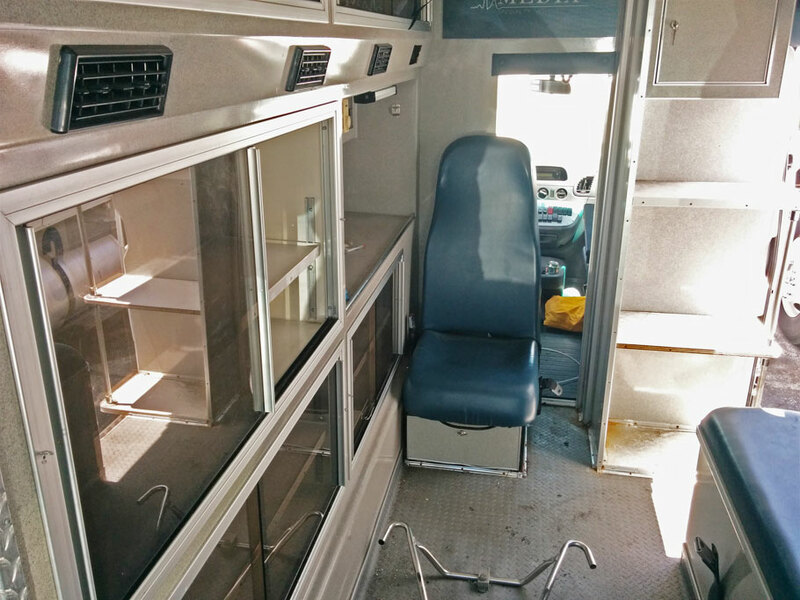 Many happy travels and times in the White Whale….hmmmm….the ambulance could have had strange extras…ghosts!!! But then you could have offered tours of your ghostmobile. ENJOY! Thanks Debnie! The ambulance could have been way fun – but we opted for practice instead. No doubt we will have fun with Ballentine Blanca! Wishing you guys many happy days on the road! That’s a beautiful van! Wishing you so many happy times and travels! Thanks Donna! We are hoping to have a lot of new adventures in Ballena Blanca this fall! Yeah – sometimes you gotta go for what’s practical instead of what might be cool. Coolio!!!! Diggin the van- happy travels and hope to see ya in Mexico!!!! So can’t wait to get to Mexico! I just signed up for a new Spanish program right now. Yes! I was part of the Van craze back in the early 70s. I had a 1960 Ford van to be used for ‘agricultural’ purposes. We were trying to grow riesling grapes up in a canyon off the Cuyama valley in California. Didn’t work–I couldn’t get the spring walled off and feeding into the storage tank. Not a one man with a shovel job! John! We have missed your comments! We need to hear more of your stories! Am now a loyal follower. So happy daughter, Kristina, introduced me to 2 fascinating people who appear to enjoy the world and their life in it! Happy everything! Thanks for following along Kathleen. We, of course, really enjoyed meeting you this past Spring, as well!